Arbiter’s Grounds from Twilight Princess was an interesting dungeon… a Hyrulian prison set deep in the desert and, seemingly, run by the Sages. Being the game’s scary dungeon, it had plenty of undead and a creepy song. What a lot of people don’t realize, though, is the opening jingle of the song — that demonic breath, or growl — foreshadows something later in the dungeon, something that also happens to be one of my favorite moments in Zelda and one worthy of Halloween. In the mini-boss chamber deep within the dungeon, the player enters a dark room and is locked inside. It’s an epic scene, in which Link cannot leave the chamber until he cuts one of the seal-covered ropes tying down the Death Sword, the mini-boss itself. As the sword pulls itself up out of the ground, it utters another growl-like breath almost identical to the opening jingle of the dungeon. The battle begins against the disembodied sword, but using your animal senses in wolf form reveals a figure carrying it… and then once you attack the beast, the true form of the demonic ghost wielding the sword is revealed. This fight is one of my all-time favorites of the series. In terms of atmosphere, it’s practically unbeatable. Few other moments in the series have this much build-up and presentation, even beyond other mini-bosses. Twilight Princess gave its mini-bosses as a whole quite a lot of love, but never as much as it gave the Death Sword; Nintendo clearly put more love into this mini-boss than any other in the series, putting a lot of work into all that atmosphere and an epic multi-stage song that accelerates as you’re about to reveal the Death Sword’s true face. 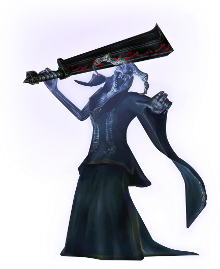 It’s also worth noting that since Stallord was only revived after Zant himself appeared at the end of the dungeon, the Death Sword was actually the main evil lurking in the dungeon. Whatever it was is a mystery, but we know it was a horrific entity, and for whatever reason it was sealed within Arbiter’s Grounds, its demonic sounds heard even upon entering the tomb-like prison. It’s an epic concept and a frightening beast. It’s too bad the Death Sword is such an easy battle, because it’s not only one of the best concepts of the series, but it has some of the best execution too. A pity the gameplay couldn’t live up to that, but even if it didn’t, the Death Sword is still one of the best moments in Zelda for me and an easy favorite out of Twilight Princess. But what about you? Did you think the Death Sword was a cool, scary concept, and did you think Nintendo executed him well? Or did you feel the opposite? And what did you think of the fight itself? Where does the Death Sword stand in terms of your favorite Zelda moments? Tell me in the comments!